PlayerUnknown Battlegrounds’ new event, War, turns the battle royale game into a regular multiplayer shooter full of large teams and quick respawns. It’s loud, messy, and a damn good time. Following the clumsy flare gun event, which was far too dependent on finding the damn gun, PUBG’s events have ramped up the intensity. This improvement started with the Tequila Sunrise event, which only allowed shotguns and melee weapons. That event led to plenty of tense battles. The new event, War, keeps up the pace. War started last night and lasts until the 15th. It’s basically a Team Deathmatch that splits players into 10-person squads. If someone dies, they respawn in the game’s plane and can dive back in. The goal is to get to 200 points, with kills worth three points and knockdowns and revives worth one. Players drop in with random weapons—almost always an assault rifle or sniper rifle—and can immediately start blasting away at the other team. The play area is fairly small, taking place on a section of the forest map Erangel contained by an immobile blue circle, and the fact that you can see your enemies parachuting in means that there’s always a target nearby. A massive deathmatch might seem like a betrayal of PUBG’s slow combat, but there’s still plenty of room to get creative. I’ve seen teams leapfrog from rock to rock, giving each other covering fire throughout. I got caught up in a battle at the military base where each team’s reinforcements parachuted directly next to their teammates as squads shot at each other from the rooftops. Robbed of the lengthy positional mid-game of normal matches, War feels like the end of a particularly violent round. 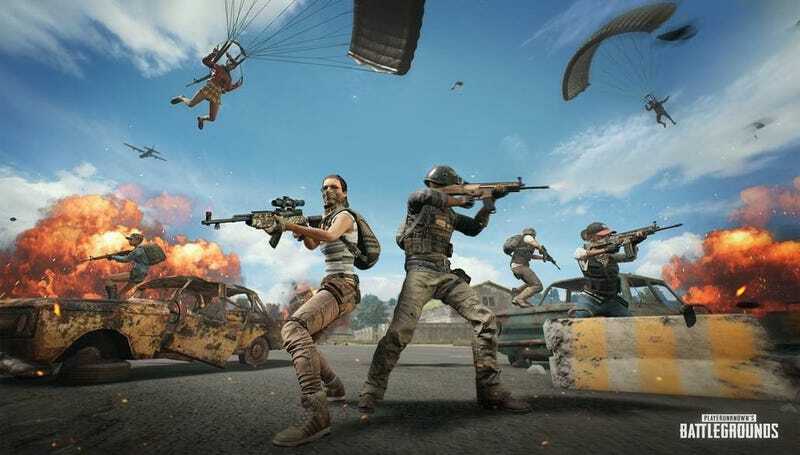 While it might have been nice for a few things to be different—having the playzone close as time goes on or increasing the frequency of supply drops—War offers some of the bloodiest shootouts you’ll ever have in PUBG. I previously said that the problem with the flare gun mode was that it didn’t feel like an event, but War definitely does. Not everyone’s going to enjoy it but, like Matthew McConaughey said, sometimes you need to go back to move forward. Team deathmatch is a game mode many of us have played before, and PUBG’s version is worth checking out.